Charlton is a rural township on the Calder Highway 220 km north-west of Melbourne. It is on the Avoca River, which has flooded the town from time to time, including in 2010. Charlton was named after the East Charlton and West Charlton pastoral runs, either side of the Avoca River, taken up by Robert Cay and William Kaye in 1844. It is thought that the inspiration for the name of the pastoral runs was the town of Charlton in Dorsetshire, England. Charlton was at a crossing place on the Avoca River, and in 1863 the East Charlton Inn was opened. The town of East Charlton was surveyed in 1867. It was known by that name until another Charlton, near Beaufort, was renamed in 1879, and the 'East' was then removed. In the year the town was surveyed a bridge across the Avoca River was built. Farm selections became available in the early 1870s, and most were taken up by 1874. A Presbyterian church was opened in 1871, a Methodist church and a government school were opened in 1874, and Catholic and Anglican churches in 1875 and 1876. Charlton's population was about 600 in 1881. During the 1880s further amenities and institutions were established, including a mechanics' institute (1883), a public hall (Victoria Hall, 1884), and an agricultural society (1881). The land around Charlton was good for growing wheat, and two flour mills were opened in the 1870s. (The mill in Charlton east was enlarged in the 1920s after closure of a mill at Wycheproof, and it was large enough to handle the district's whole harvest until closed in 1973.) 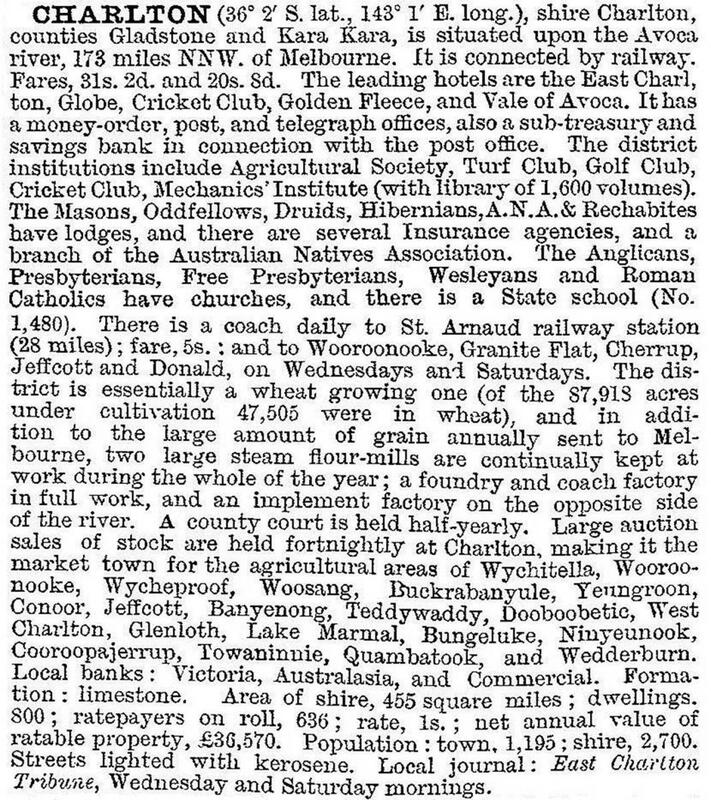 The railway line from Korong Vale to Wycheproof, via Charlton, was opened in 1883. The Catholic (St Joseph's) church was built in 1875, and in 1896 it established a primary school. A replacement church building was erected in 1907, and in 1959 the school was enlarged before becoming a joint campus in the McCauley College. The primary school remains in Charlton. The secondary (McCauley) campus was relocated with the Donald and St Arnaud campuses to Dooboobetic in 1976 and closed in 2003. Charlton was the dominant township in its shire. From having over one-third of the shire's population in 1900 it had nearly one-half ten years later and nearly two-thirds by the 1960s. Improved town-water supplies came with the construction of a channel from the Lake Lonsdale reservoir in 1926. A swimming pool was opened in 1927. In the next decade a bush nursing hospital and a picture theatre of art deco design were opened. During the post-war years Charlton underwent moderate expansion, including 75 housing commission dwellings built in 1946-60. A high school was opened in 1963 and a TAFE in 1978. After the 1960s, however, the town's population contracted. Three hotels closed, the flour mill closed and the railway passenger service closed in the following decade. One of the few hopeful signs was the enlargement of Charlton's grain silos, 1977-86, and the opening of a cattle feedlot by Coles supermarkets (1987) at Yeungroon, 10 km south-east of Charlton. It became the district's largest employer. Charlton has a racecourse/showground, a golf club, a community sports centre, a public reserve with a swimming pool, bowling and croquet facilities and a caravan park, a motel, the East Charlton and Cricket Club hotels, State and Catholic primary schools, a secondary college, the North Central Education Centre, three churches and a hospital. The mechanics' institute building is a museum and the court house (1882) is a community facility. The Rex cinema is run by enthusiastic citizens. One of Charlton's notable personalities was Brigadier-General Harold 'Pompey' Elliott (1878-1931), who was born at West Charlton. He was held in exceptional regard by his troops, but clashed with his superiors. In September 2010 and again in January 2011 many parts of regional Victoria experienced widespread severe flooding. In Charlton the Avoca River flooded four-fifths of the town and damaged critical infrastructure for the grain industry as well as homes and businesses. Many of the town’s historic homes and buildings including the Rex Theatre were damaged. It was estimated that 400 properties were affected. 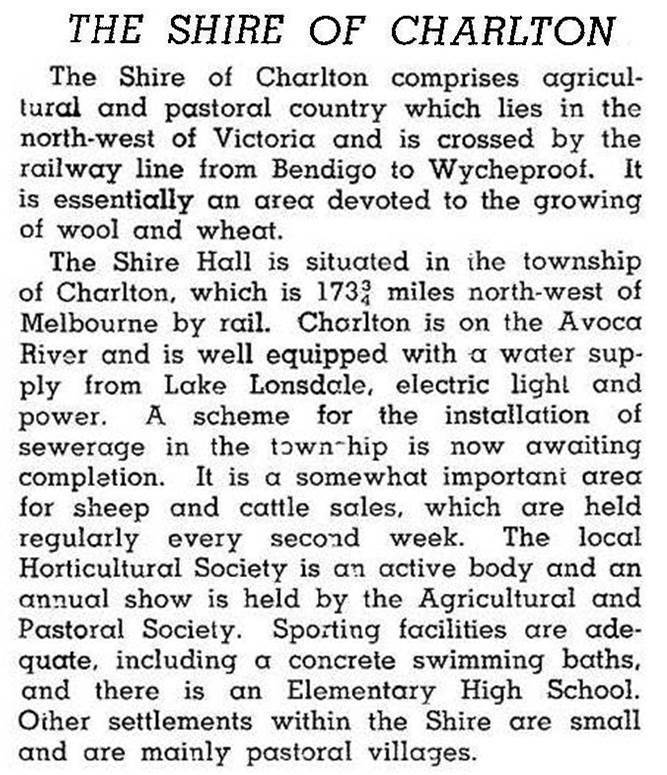 The Charlton district was part of Gordon, St Arnaud and Korong Shires until it was proclaimed a separate shire on 28 May 1895. Eighty-three percent of Charlton Shire was used for farming purposes in 1994. Slightly under half the farm land was used for crops, yielding 35,000 tonnes of wheat, 25,000 tonnes of barley and other (mainly legume) crops. There were also 112,000 sheep and lambs, nearly 27,000 cattle and 2000 pigs. On 20 January 1995, Charlton Shire was united with Birchip and Wycheproof Shires, most of Donald Shire and part of Kara Kara Shire to form Buloke Shire. Wycheproof is Buloke Shire's administrative centre.